The Williams Sound EAR022 is a single-sided, clip-on earphone ideal for use with personal listening devices. The clip is designed to fully surround the ear for maximum stability and comfort. 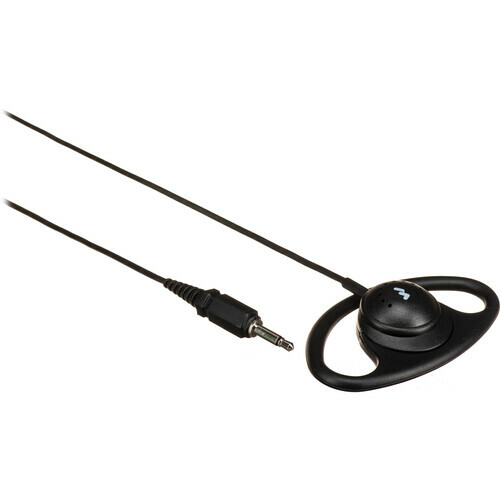 The monaural 1/8" mini-plug is compatible with a wide variety of devices. Box Dimensions (LxWxH) 2.7 x 2.2 x 0.3"
EAR 022 Surround Earphone is rated 4.2 out of 5 by 9. Rated 5 out of 5 by Vagregg from Good alternative Our church has used a hearing assist system for several years. We recently reviewed the use of the system and knew we had some members who should be using the system but don't. We purchased some EAR022 clip-on's a little over a month ago along with some EAR021 headphones. Some regular users of the system liked the sound from the headphones while others prefered the clip-on's with their hearing aids. Now some of the non-users have started using the system. Rated 1 out of 5 by Rod from Monaural Clip-on does not fit on the ear This entire unit is made as one piece out of hard plastic. The loop of the ear clip is inflexible and uncomfortable. Apparently the ear piece can be bent a little to help it fit individual ears, but there are no instructions for doing so and mine broke before I was able to bend it enough to fit securely, comfortably and flat against my ear. Rated 4 out of 5 by Gigi the daughter from My Mom can Hear! This is easy to use and very worth the money. My Mom is 97 years old and not too easily trained in new things. She can manage this with much ease. I did have to buy a different ear piece as the buds kept falling out of her ears but now she is good to go. Rated 5 out of 5 by ExPow from Works Great! I use this earphone with a remote receiver hearing device during church services. It is comfortable, reliable, and delivers quality sound. And, it is less expensive than the original earpiece that came with the hearing device. Rated 5 out of 5 by Bruce from Great product. Does what it says. Good quality. ?? I'm deaf in one and half deaf in the other. This item really helps. I can highly recommend it. Also the delivery price from NY to Auckland was very reasonable. I will be saving B&H to me contacts. Rated 4 out of 5 by Phil from Hear, through one ear! Why sacrifice had of the quality of your music, just to pay attention to your surroundings? Get stereo sound in one ear! Rated 5 out of 5 by danceman99 from Good product - quick delivery Use on my hearing assist in the dance hall to hear caller's instructions. Holds more securely than one I had before. Rated 5 out of 5 by Owen from Great Earspeaker Works well with Gestner Units. Are these earphones very durable? How long do they last for? Asked by: Living Hope I.
Clip-on earphone is better than I expected. I bought it as a temporary solution. It literally saved me $1700 in real earpieces, I have no need for them now that I tried the clip. I highly recommend it. It is good quality material, it wraps around the ear comfortably and stays put. The sound is great and adjustable. The under $20 price tag is incredible for the use it gives. It was a blessing to find the pocket pro and clip-on earpiece. BY THE WAY the headphones that come with the pocket pro are definitely not good...they do not fit properly and have no give for adjustment. It is worth the extra money for the clip. If shelling out a little more is out of the question you can wrap a peice of fabric around the head-peice and it will fit comfortably as a headband, then it will stay In place. Good luck!